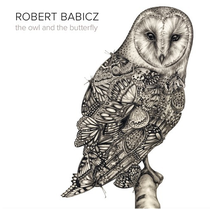 Robert Babicz releases ‘The Owl And The Butterfly’ on Systematic Recordings this month, the final in the artist’s trilogy for the label. It’s an album driven by Babciz’s own deep connection, or ‘oneness’ with nature he experienced during walks through the Königsforest near his home in Cologne. The resulting 20-track opus is a journey through the ‘Babiczstyle’ of house, techno and electronica. The album may not have come to fruition if it wasn’t for the producer’s willingness to listen to his intuition and begin daily wanderings through his local forest while suffering a personal crisis that saw him lose his passion for production last year. Babicz describes the daily two-hour walks that proceeded the album production sessions as “bringing him back to himself” and in those moments of silence surrounded by the lush forest there was a sense of oneness with what he was perceiving. It’s this tranquillity and sense of harmony that’s reflected in the album, as Babicz takes on the role of a subtle, understated storyteller. This is evident in everything from ‘Bensberg’ that combines multi-layered bass notes encased in a warm cocoon of an acoustic guitar, to the cosmic warp of ‘A Girl From Jupiter’. It’s out 22 June, get it taste from it below.